Nowadays audio guides are provided in many museums and other sites, and they also come in a variety of forms as guided walking tours of cities, enabling people to take a tour at their own convenience. The audio guide is a cross between a traditional city or exhibition guide and an audiobook, and is above all a way of sharing knowledge. The grand tradition of art in public spaces, as it appears in different forms all over Hamburg, represents a crucial part of so-called public sculpture. This, among many other things, distinguishes the city’s character. Public sculpture of this nature is above all an indicator and guarantee for an on-going public dialogue on art, world affairs, society, and the key issue: how do we want to live? This audio guide covers around 100 sites spread over various districts of Hamburg’s inner city. As well as discussing artistic and other aspects of the sites they visit, the two protagonists Thea von Testing and Ludwig Lektor also shed light on what the art historian and long-serving head of Hamburg’s culture department, Professor Volker Plagemann, calls “public sculpture”. You can listen to Thea and Ludwig’s conversations in situ at each respective location and put together an individual tour of your own. We have suggested three longish walks that are thematically linked, but this doesn’t mean you have to do all three in their entirety. 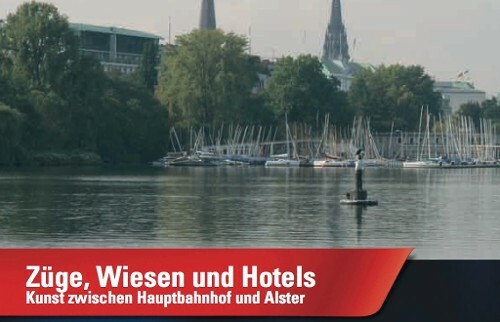 The tour called “Trains, Meadows and Hotels” runs from the Main Station around the Outer Alster Lake and back again. It deals with classical sculpture of varying types and qualities, outstanding teachers from Hamburg’s Academy of Art and their students, weighty assertions and historical exhibitions. In particular, this walk sketches the development of sculpture outside the museum through to art in public space as we know it today. In their discussions, Thea von Testing expresses the views of a politically critical cultural historian, socialised within pop culture, while Ludwig Lektor is more a classical teacher of art history who generally derives his knowledge from books and source material, and who judges things according to strict notions of quality. Whenever it’s possible or helpful, Thea and Ludwig discuss contentious issues with the artists themselves. The audio guide is funded by the Hamburg Ministry of Culture. As an ongoing project that was started in 2009, it aims to foster a greater understanding and awareness of art in public space in Hamburg. In cooperation with the revisionsverlag, the participating voice actors, translators, researchers and recording producers, we have assembled a differentiated and varied spectrum of ideas and information about artworks, strategies and urban space as they have evolved from the past to the present. We hope you enjoy these discussions, which seldom make a distinction between high and low culture, and in both a formal and a thematic sense see themselves as part of the tradition of art in public space. Eine schöne Tour. Vielleicht etwas lang, man sollte sie sich in zwei Abschnitten vornehmen. Tolle Sache. Muss ich mal probieren! Surrounded by foreign embassies, villas and world-famous hotels, the Outer Alster lake has always been the place to go for a pleasant stroll in the very heart of the city. You’ll soon see that art occupies a prominent place in these elegant surroundings. Then a space was found that actually lay directly beneath the Kunsthalle: a disused underground tunnel. We thought it was an interesting location, so we said we’d try to transform the piece to make it right for the site. What does up or down or left or right actually mean? Are they geographical coordinates, geometrical dimensions, political positions or existential states? Ideally my works define or redefine the locations. Sometimes I like simple things like that. A large open space with a smooth surface that’s perfect for skating on, a stage-like setting, a bit of public attention, a brilliant view – and all right here in the centre of the city. Franz Erhard Walther, “Sieben Orte für Hamburg” – Seven sites for Hamburg. The work of art as an instruction for some kind of action. A marked site. Man as the producer of the work of art and the developer of meaning. The American General Consulate. Increased danger of attack. Global terrorism. 9/11. And: Martin Haller! The metamorphic shore of Herr Lienau. Here someone has claimed the right to participate in making public art and to be visible in what he’s doing. In May 2000, Thomas Stricker erected a dome-shaped tent here. Inside it he set up a public workshop open to anyone who wanted to come, and it was here that the meteorite was made… was brought down to earth, was born, hit the ground. Science fiction and mythology. Past and future. Heaven and hell. Orpheus weeping at the tomb of Eurydice, beseeching the gods for mercy. Gerhard Brandes, born in 1921, was committed to figural sculpture and worked for clients who were keen to see more figural representation. 53km long and has its source in a small place north of Hamburg called Henstedt-Ulzburg. It has 9 locks and about 100 bridges. A triangular, semi-transparent, mirrored space, 2.2m high with a triangular steel roof rotated at 45 degrees to produce the form of the Cross of David. Incidentally, in the catalogue of playground equipment, “The Clown” comes under the heading of ‘vandalism-resistant stroke stainless steel’. His idea was to install an enormous sculpture of three men standing on an enormous plinth, 30 metres high, and for this to become a key landmark and symbol of the city. Here you have the Holy Trinity Church. Up there is a street called Koppel where there’s a well-known artists’ house, and further back is the Lange Reihe, the busy main street that runs through the centre of the ‘village’ of St. Georg.